An hour or so ago on this first day of September an afternoon rain began. While the drops continued to fall the sun emerged, bathing the garden in glistening light for a few moments. August ended rather dry so this rain is appreciated. The skies are still rumbling, so perhaps the plants will get a good watering. The storm dropped the temperature from 86° to 77°. This entry was posted in garden and tagged almanac, garden almanac, meditation circle, sunshower on September 1, 2013 by pbmgarden. Lovely photo of your peaceful garden. Thanks for your kind remark Judy. Beautiful garden — rain and shine! The sunlight after a rainshower is always welcome and it really lights up your garden… magical! Thanks Cathy. I love the play of light in the garden but seldom get a photo that captures it. Both you and your garden must have felt a lot better once the temperature dropped with your shower. Pauline, the storm continued for hours, lots of thunder, but temperatures will be 92F today. 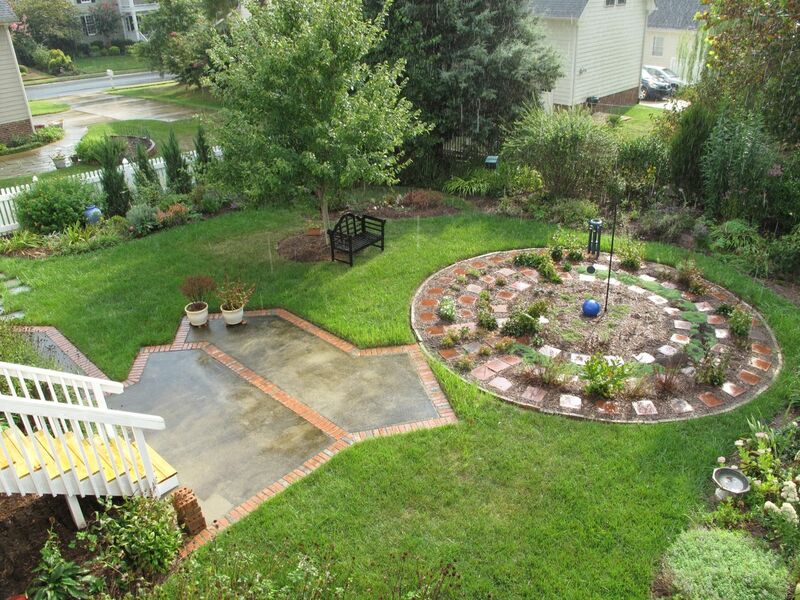 Drought or no drought, your garden always looks good. It rained with sun here too yesterday in the morning, bizarre isn’t it? Thanks Alberto. Sunshowers are a bit of nature’s whimsy. That’s cool you also had one. We had a big storm last night as it dropped an inch of rain and had a lightening storm for 45 minutes…September has come in with a bang…love your pictures of your garden. Hope the rain nourishes your garden Donna. Mine look happier today. Everything looks very green and lush, what a difference a little rain makes to the temperature as well as to the plants. Very hot and humid today, but the abundant rain has felt so luxurious this year, keeping things greener than I remember in years. I wish you’d send some of these clouds over here. It’s starting to look a little parched…great to have such a lush, green garden at this time of the year. Your circle looks very pretty. Thank you Annette. The circle has perplexed me lately but that’s good–I’m mulling over some ideas for it. Hope you get some helpful rains soon. Once again, I’m refreshed just looking at your garden. Thanks, neighbor. Oh, I’m so glad Linda! Quite a storm last night wasn’t it? I like the streaks of rain visible in the photos. I love your meditation garden — it looks like such a peaceful place. Thanks, I find it very peaceful. 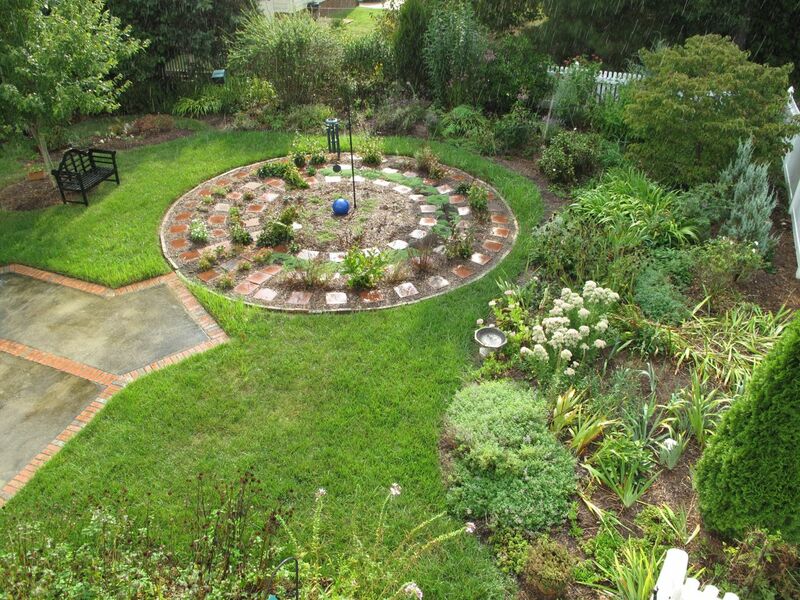 I use the circle for walking meditations and as a focal point for the garden.